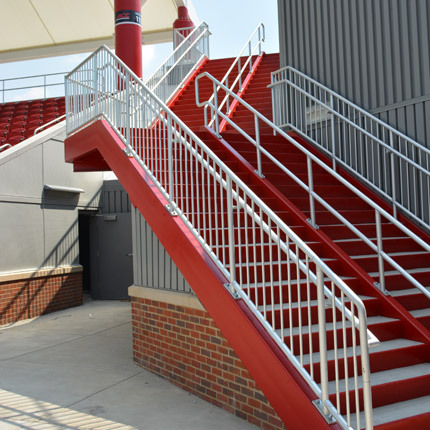 Our Stadium Rail system is actually a wide open concept of railings, with many options for both the railings and the infill panels. 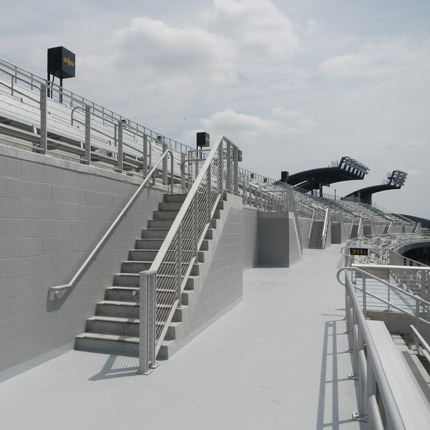 Our standard Stadium Rail system consists of 1 1/2″ dia. Aluminum railing posts, with a 1Â˝” dia aluminum top and mid-rails. These rails are used for the aisle bowl rails and can have several finishes or coatings applied. From our standard clear anodized finish, to a painted kynar finish to match the team colors, we can supply anything you’re looking for. We also have a one post railing for lower and upper bowl use, with a looped handle. This is the most cost effective product for stadium and arena bowl rails. While you have more posts throughout the facility, it’s only one post per aisle, which considerably cuts down the amount of materials used, which in turn, cuts down the price. This product is also provided in 1 1/2″ dia aluminum or stainless steel. Again, it can come in several different colors. 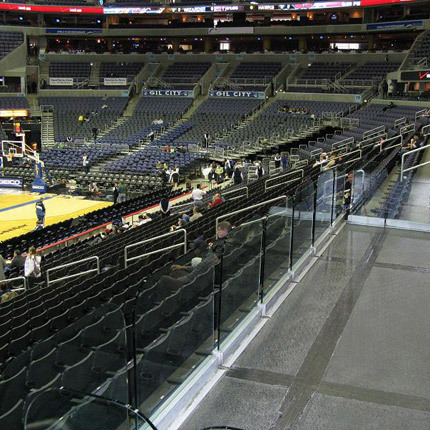 Our Stadium Glass Rail has several options. Our standard sizes for glass panels are 3/8″, 1/2″ and 3/4″. These are typically clear tempered panels, but several options are also available. (Please go to our Infill Panel page to see just some of your choices.) The glass also has several choices of how it’s applied. One application is our standard glass rail shoe mold, which fits into the concrete and is hidden. The glass panel slides into the shoe mold and a handrail top cap is applied in either aluminum or stainless steel, or we can have the top and side edges of the glass be polished so no cap in necessary. Another product we offer for glass handrails is our Clip Rail system. In this application, the glass panels are held into the railings by using stainless steel or aluminum glass clips, which are attached to the sides of the handrail posts and hold the glass panel in place. We have used both of these systems in several stadiums and arenas around the United States, and we feel both are an excellent choice. Finally, we can also offer several other types of railings for other areas of the facility. 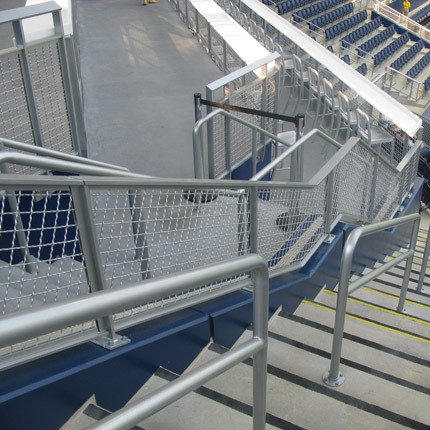 From standard aluminum or stainless steel picket railing to the more ornamental perforated metal infill panel railing, we can also tackle the more custom portion of the handrails. 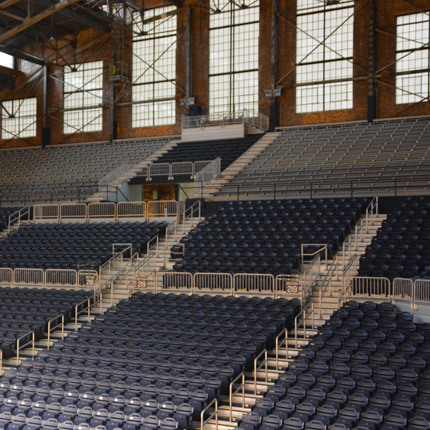 We really feel like we’re a one source fabricator for stadium and arena handrails.